I'd thought I'd break the sports car theme that seems to be going on at the moment during our Car Spotlight month with something a little more luxurious. 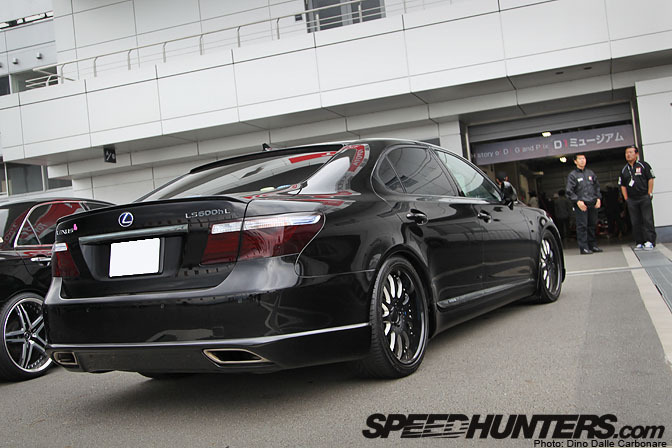 As I was making my way back from the podium celebrations on Sunday at the D1 event in Fuji Speedway, I spotted this conservatively modified Lexus LS600h sitting outside the press room doors. 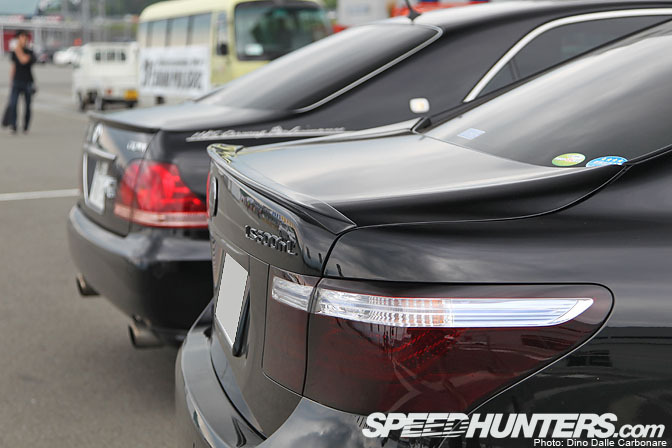 …to the little trunk spoiler and slightly blacked out tail lights. The inside of the front projectors were painted in flat back, further emphasizing the "black on black" theme of the car. 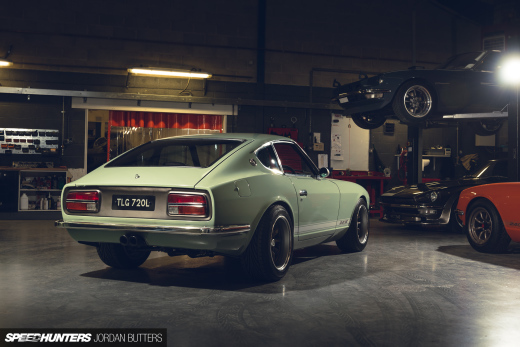 …and it seems the owner got it right by lowering the stock air-suspension. 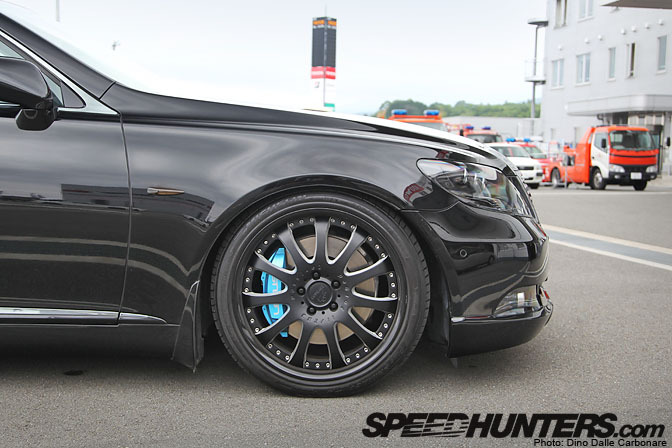 Check out the repainted brake calipers hiding behind the split rims. 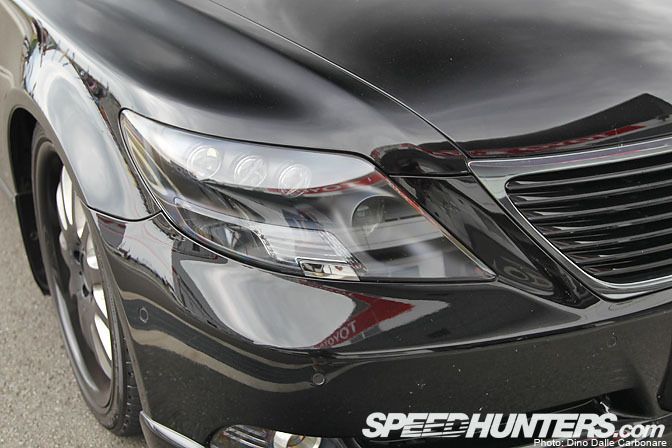 This LS600h proves how you can improve the look of any big sedan with the right stance. It might not be pushing the boundaries of high-end VIP tuning but it sure gets the looks which is what VIP has always been about. This is an amazing car, you got to love it when VIP is done right! omg. do you have any more pictures of it? How about desktops prz! VIP perfection. Good lord I love Blacked out sedans but as a Florida native the heat is damn near unbearable if left out of the shade. Great find! Will somebody else agree with me that this beast needs at least 15mm spacers all around and/or possibly different wheels..? How do you get this effect with your photos? Filter? 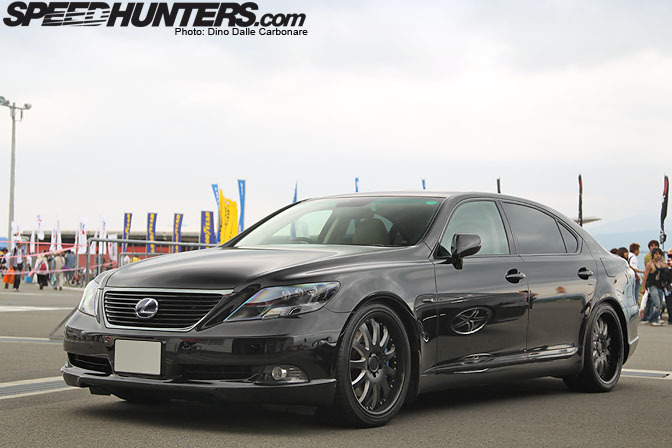 Wow~ never ride in luxury ride like that~ stock air suspension is really cool when it can be lowered that much! really good looking...love those rims! 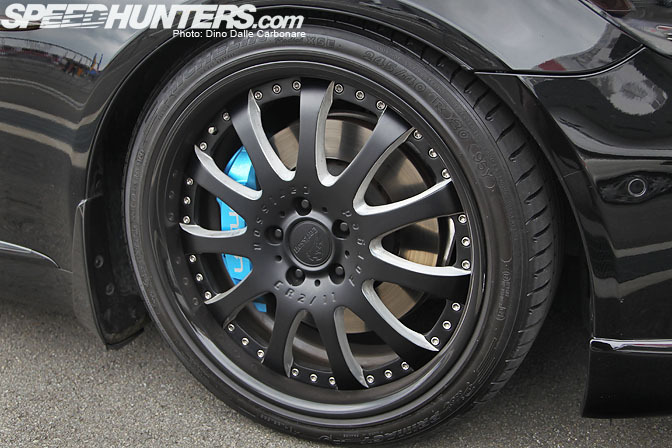 Mhm, I love the color of the brake calipers against the black wheels! Something about the mecanical mods whold be good either. 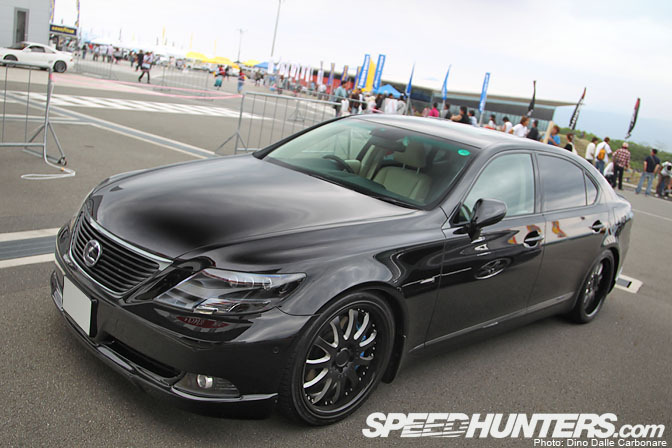 i agree, spacers or wider wheels would make this beast even better. Perfect. 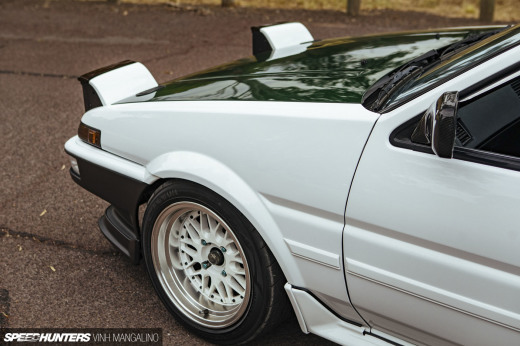 No stupid camber, reasonable drop, great looking car! You can't get them that low stock, you need a special ecu box to overide the stock settings. That car is lowered the PERFECT amount. That would be a PERFECT car for me. 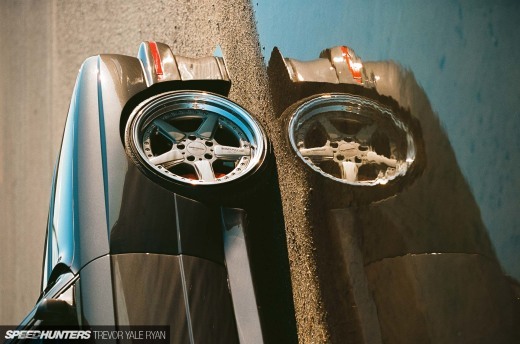 That's not VIP at all.. stance is waaaay too weak. i saw it in person at fuji. it's what all hybrids should look like... but it needs to go lower with better fitting wheels.